Built as a pair alongside St Martin’s Theatre, the Ambassadors Theatre was originally designed by prolific theatre architect W. G. R. Sprague. Situated in West Street, the theatre has been home to musical phenomenon Stomp for a number of years. With an intimate seating capacity of 444, the Ambassadors Theatre is one of the West End’s smallest venues. Split into two levels that include the Stalls and the Circle, views from seating is good, with clear views of the stage from most rows. A slight Circle overhang kicks in at the back of the Stalls, but aside from this, you always feel close to the action with an unrestricted view. Check out our price chart below, which gives more details on exact ticket prices and what you get for your money. Remember that the cheaper seats still offer brilliant views! £67.50 (Premium Seats) Not available. Premium seats are located in the front and centre of the Circle in seats 7-16 of Row A and 8-15 of Row B. These seats are the best in the house, giving an excellent, unrestricted and close-up, panoramic view of the entire stage. £57.50 The majority of the Stalls are this price, from rows C-M. Views are unrestricted and feel close to the stage, ensuring that you do not miss a detail. There is limited legroom in rows C-D as well as the centre of Row L. Rows A-G of the Circle fall under this price, with clear, close-up views of the whole stage. No action will missed from these seats due to the intimacy of the theatre. There is limited legroom in rows C-E and Row G.
£39.00 Rows N-P of the Stalls are this price, due to being towards the rear of the theatre. These seats can feel slightly distant from the stage and are restricted by the Circle overhang. This price applies to seats in rows H-J, which are relatively distant from the stage and can feel more distant from the action. £26.00 These seats are located at the rear of the Stalls, in rows Q-R. These seats are distant from the stage and are heavily restricted by the Circle overhang. These seats are in the back two rows of the Circle, K-L, and are discounted in price due to being distant from the stage. 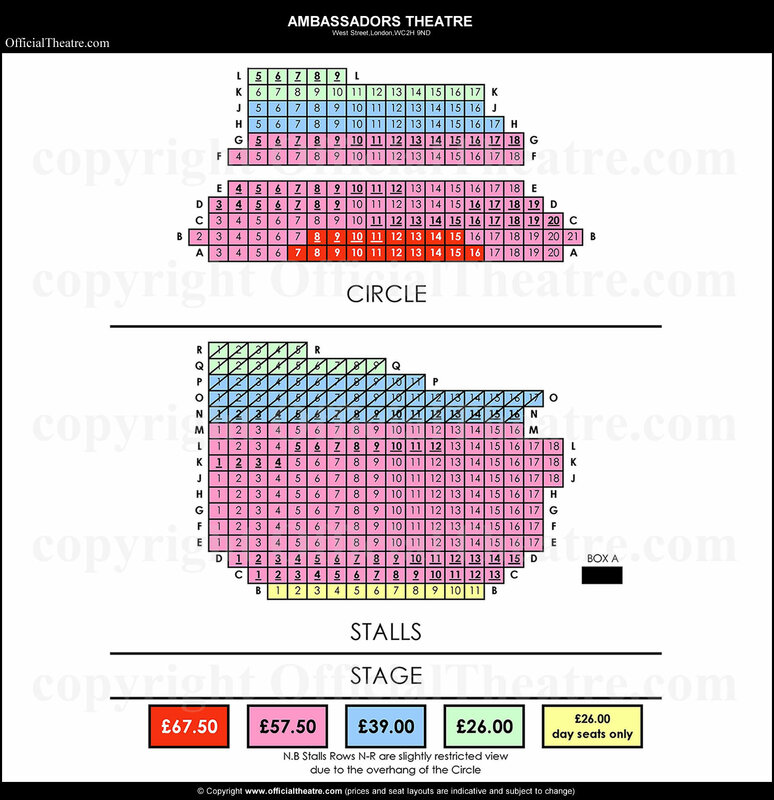 Day Seats (£26.00) Day Seats are located in the front row, Row B, of the Stalls. They are a huge bargain and worth queuing for, as seats in Row C are £30 more expensive for a very similar view. Not available.